To escape the arctic tundra that is New England, I recently visited the oldest city in Georgia, Savannah. While I knew little about the city before the trip, I knew it featured a few of my favorite traits: walkability, warmth, charm, and good food. I spent the majority of the trip strolling down the quaint, cobblestone streets lined with dangling Spanish moss and sprawling oak trees. As I hopped from square to square (22 in all! ), I kept my eye out for some foodie finds. I feasted on many southern staples like shrimp and grits at Alligator Soul Restaurant, pork shank at The Grey and pecan honey-glazed fried chicken at The Pirates' House. Along with the modest, no frills menus at many of the highly regarded restaurants, I also noticed the use of local ingredients and ever-changing, seasonal dishes. Many eateries already had spring-inspired menus with an abundance of bright salads and slaws. Instead of using basic romaine and a simple dressing, many used fresh, in-season greens, herbs and exotic, citrusy touches. Inspired by the cascading Spanish Moss all over Savannah, I decided to make a salad of swirling greens using one of my favorite vegetables, Brussels sprouts. While Marni and I have made many recipes using the small cabbages, we usually roast or sautee them. This time, I finely cut the raw Brussels sprout into super thin strands and mixed them with a bright, citrus vinaigrette, salty Parmigiano Reggiano cheese, sweet Navel oranges, and toasted walnuts. Whisk all of the Citrus Vinaigrette ingredients together in a small bowl and set aside. Throw the Brussels sprouts into a salad bowl, allowing the layers to separate. Add the walnuts, orange segments and flat leaf parsley. Drizzle the dressing over and toss to combine. Top with the shaved Parmiggiano Reggiano, salt and pepper. Serves 4. A fresh take on salad, just in time for spring! 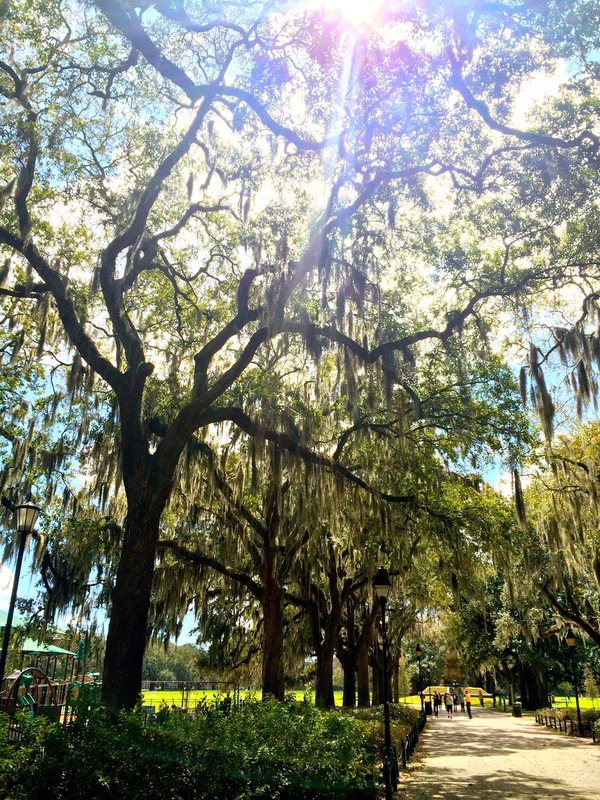 Stay tuned for more Savannah-inspired treats to come. . . .